Munich, Germany—Recent results with the investigational targeted therapy alpelisib, a PIK3CA inhibitor, showed impressive clinical benefits. Adding alpelisib to fulvestrant (Faslodex) extended progression-free survival (PFS) compared with endocrine therapy alone in patients with hormone receptor (HR)–positive, HER2-negative advanced breast cancer characterized by a PIK3CA mutation, according to the results of the SOLAR-1 trial presented at the ESMO 2018 Congress. The study showed benefit only in patients who had the mutation, in whom alpelisib nearly doubled PFS. These findings suggest that genomic testing can select patients who will respond to alpelisib, which will affect clinical practice. In patients with the PIK3CA mutation, the median PFS was 11 months in the alpelisib group versus 5.7 months in the control group (P = .065), at a median follow-up of 20 months. No benefit was observed in patients with cancers that did not carry that mutation. The SOLAR-1 clinical trial findings were greeted with enthusiasm, because alpelisib has outperformed previous PIK3CA inhibitors that had been studied in breast cancer. “Previous PIK3CA inhibitors target all 4 isoforms, so there were a lot of toxicities. Alpelisib blocks only the alpha-isoform [PIK3CA] of the enzyme, which is the one that is mutated in breast cancer,” said lead investigator Fabrice André, MD, PhD, Breast Cancer Unit, Department of Medical Oncology, Gustave Roussy-Cancer Campus, Villejuif, France, who presented the trial’s results. 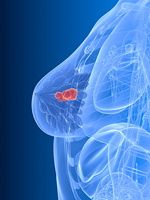 “Alpelisib is the first drug to show a benefit in a genomic subgroup of breast cancer patients. For now, the follow-up is short, so we cannot determine if there is a long-term survival benefit. But alpelisib increased PFS, and that will hopefully translate to improvement in outcome,” Dr André stated. He added that the results will have a major impact on clinical practice in patients with HR-positive, HER2-negative breast cancer, because genomic testing will be needed to identify patients who could benefit from alpelisib. In addition, access to the drug may be a hurdle in some countries. SOLAR-1 enrolled 572 women or men with HR-positive, HER2-negative advanced breast cancer who received ≥1 previous lines of endocrine therapy but no chemotherapy for advanced breast cancer. The patients were randomized to oral alpelisib 300 mg daily or to placebo plus fulvestrant 200 mg every 28 days and on days 1 and 15 of treatment cycle 1. Tissue testing showed that 341 patients had the PIK3CA mutation; of these, 169 patients were randomized to alpelisib plus fulvestrant and 172 to fulvestrant alone. Approximately 50% of the patients in each arm had visceral metastases, and approximately 6% had received previous CDK4/CDK6 therapy. In this clinical trial, the most common side effects associated with alpelisib included hyperglycemia, decreased appetite, and rash. The most common events of any grade were hyperglycemia (64% vs 10%) in the alpelisib arm, diarrhea (58% vs 16%), nausea (45% vs 22%), decreased appetite (36% vs 10%), and rash (36% vs 6%). Most side effects were grade 1 or 2. Grade 3 or 4 hyperglycemia was 36.6% with alpelisib and grade 3 rash was 9.9%. Overall, 6.3% of patients discontinued because of hyperglycemia and 3.2% because of rash. Toxicities with earlier, less-specific PIK3CA inhibitors—taselisib and buparlisib—led to discontinuing the development of these drugs. Although alpelisib has less toxicity than its predecessors, Dr Dent said that the drug still had “significant clinical toxicity, which is not unexpected, given the metabolically driven [PIK3CA] pathway.” She suggested that different dosing schedules with alpelisib could lessen its toxicity.